The Wake County Historical Society has been working to preserve history in Wake County since 1956. With plans to organize a Wake County historical society, the Bloomsbury Chapter of the Daughters of the Revolution sponsored a meeting of all interested persons. The meeting was held in the ballroom of the Governor’s Mansion on Monday evening, November 19, 1956. The evening’s proceedings were launched by Mrs. Vance Jerome, regent of the Chapter. Mr. A. L. Purrington, Jr., served a Temporary Chairman and Mrs. Margaret H. Seawell Campbell, a leader in organizing the Harnett County society, extended greetings to the group. Mr. D. L. Corbitt of the State Literary and Historical Association spoke on the importance and function of a historical society. Five months later on Tuesday, April 9, 1957, an organizational meeting of the society convened in the auditorium of the Department of Archives and History, located at that time in the Education Building. Mr. William A. Parker was elected president at the meeting. Other Officers elected were: Dr. C. C. Crittenden, Vice President; Mrs. H. B. Norris, Secretary; and, Mr. Richard Seawell, Treasurer. Members of the executive committee were named as follows: Mr. R. N. Simms, Mrs. J. M. Broughton, Jr., Mr. Edith Earnshaw of Wake Forest, Mr. H. Sprague Silver, Judge William T. Hatch and Mr. John Burke O’Donnell. Major William Oliver Smith was elected Chairman of the nominating committee. The constitution and by-laws proposed by Mr. John H. Anderson, chairman of a committee for that purpose, were approved. Mr. Earl. T. Wilborn was named Membership Chairman. Many of the charter members were descendants of Wake County’s early families. In 1958 each charter member was presented with an attractive certificate by Mrs. Bruce R. Carter, Secretary. During its formative years, the society’s meetings, scheduled twice a year, generally featured outstanding speakers who discussed some aspect of local history. Some memorable speakers were Jonathan Daniels, Herb O’Keef and Richard Walser. As the membership increased, meetings were held more frequently, and the scope of activities was expanded. In 1964, the society’s first newsletter was published with Mrs. Elizabeth Reid Murray serving as editor for five years. Over the years, the newsletter provided the members with historical news, a calendar of events, and historical sketches by researchers. Writers from the membership included: Grady L. E. Carroll, Dr. Thornton W. Mitchell, Beth Crabtree, Vance E. Swift, and Elizabeth E. Norris among others. Special projects of the society have included tours of structures of historical and architectural significance in the county’s principal communities and historical tours of towns of interest. Local walking tours have been conducted by a number of the membership among these being the City Cemetery Walking Tour conducted on Labor Day for several years by Mrs. Betsy Johnson Shaw. The Badger-Iredell Law Office, ca. 1810, a Raleigh historic structure, was saved from demolition through the efforts of the society member Beth Crabtree. It was eventually relocated on Mordecai Square and preserved by a joint project with the Wake County Historical Society. The Wake County Bar Association contributed $50,000—approximately two-thirds of the total amount. The Wake County Historical Society later raised some $2,400 at an auction held at Mordecai Square to help purchase furnishings. Other successful projects of the society have included the publication of a historical map of Wake County and the acquisition of a showcase for the lobby of the Wake County Courthouse to display historical articles. Plaques have been placed honoring James Robertson, pre-Revolutionary hero; Jacob Marling, artist; Governor Abner Nash; Attorney General Alfred Moore; Hephzibah Baptist Church, a county landmark; and the area of the first Wake County Courthouse. Granite Monuments were placed at two unmarked graves of historical significance. The marking of the grave of Governor David Stone (1770-1818), located near Knightdale, North Carolina, was a joint project with historic Hope Foundation coordinated by Mrs. Martha G. Robinson. Extensive research of Governor Stone’s Wake County plantation known as “Restdale” was carried out by Vance E. Swift. In Raleigh’s Oakwood Cemetery, the monument of Rachel Blythe Bauer was restored, and a monument was placed at the unmarked grave of her husband, Aldolphus Gustavus Bauer. An architect of exceptional ability, Bauer is best remembered locally for his work on the Governor’s Mansion. Research for the project was carried out by Dr. Carmine A. Prioli of North Carolina Sate University, and William B. Bushong, architectural historian. 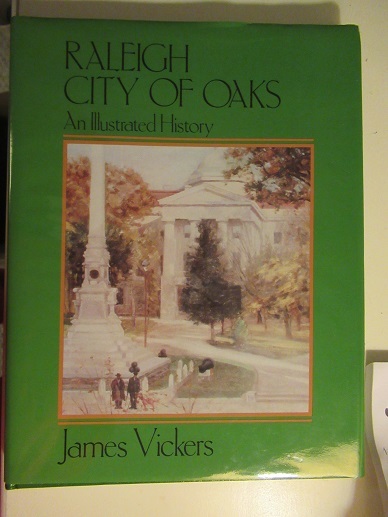 The society sponsored the publication of the Raleigh pictorial history “Raleigh City of Oaks” authored by James Vickers, and published by Windsor Publications, Inc. of Woodland Hills, California. The narrative was highlighted with outstanding pictures researched by Jan-Michael Poff. The project was chaired by Mrs. Joan Pennell, a past president of the society. Board and annual meetings have continued to be held in local landmarks and places of historical interest. It was hoped that before the next decade passes, a suitable place would be acquired for society records and meetings.